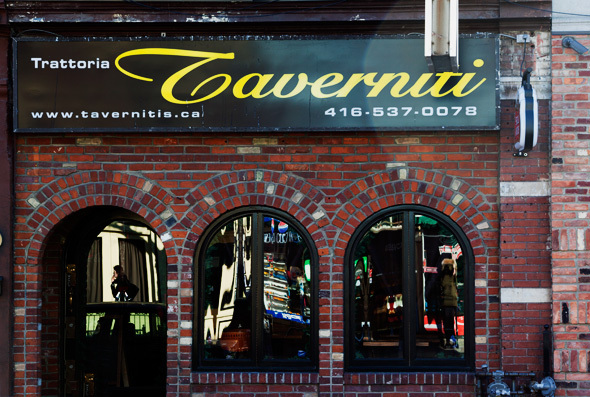 Taverniti is a small, quaint restaurant that's set up shop in the heart of Little Italy at the familiar location once occupied by the now defunct John's Classic Pizza. Sandwiched between a dozen or so other restaurants, it sets itself apart with welcoming service and humble food-focused approach. 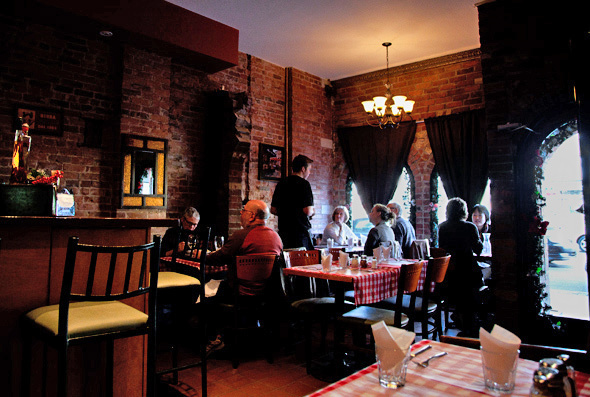 The all brick interior lends warmth to the room (something drunken revelers might not have noticed during its former incarnation), as does the ubiquitous red and white checkered tablecloths. From our table the small galley-style kitchen is clearly visible, as is the "Nonna" who is busy manhandling dough in preparation of one of the 15 pizzas on the restaurant's menu. 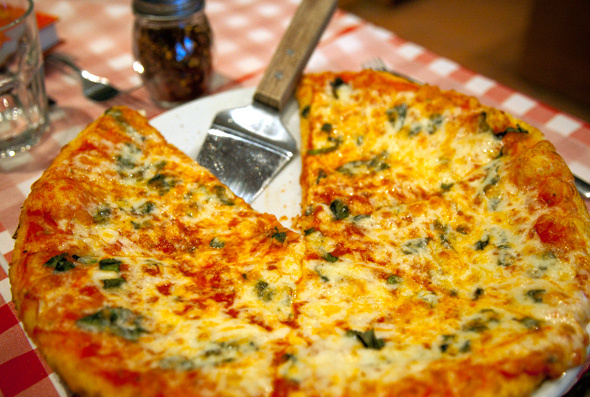 If you so desire, you can also one-up Nonna by creating your own with a la carte toppings. As was the case before, slices are also available, and there is this a steady walk in clientele. The "Nonna" in question is the executive chef, Mrs. Rosina Taverniti, who has been cooking her entire life, and judging by the smells wafting out of the tiny kitchen, I'm in for a treat. The lone busy server provided us with menus and took our drink orders. We both went for a Pellegrino product (As they say... when in Rome...) but I was tempted by the decent wine list and several (Moretti, Creemore, Stella and Moosehead) beers they have on tap. After quick deliberation, my guest opted for a simple but classic slice of pepperoni ($3.33) and I pigged out on a starter Verde salad ($6) followed by the personal margherita pizza ($12). 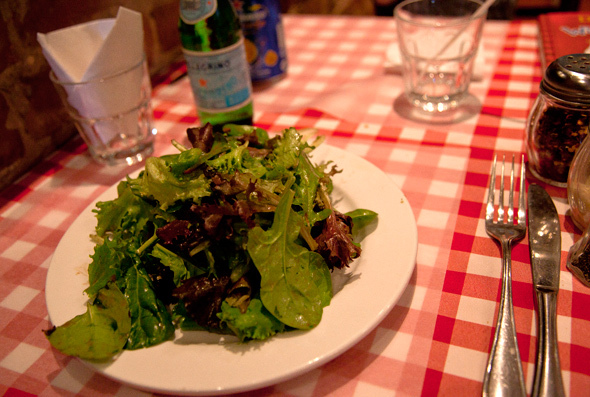 The salad arrived quickly and was dressed perfectly in a slightly creamy classic balsamic and olive oil combination. Nothing glamorous; just mixed greens and good, garlicky flavour. Some of the lettuce leaves were a touch wilted, but not enough to be off-putting (at least for me). Up next were the show stoppers. I was worried that the rather large starter salad would have filled me up a bit, but one sight of my pizza and I was ravenous again! My guest was just as eager and jumped right into her slice, though not before I stole a pepperoni off the top (we're family, stealing is ok!). The pepperoni was tender, slightly greasy and spiced perfectly with a hint of anise seed. The crust was just dense enough to contain the gooey mozzarella cheese and slightly sweet homemade tomato sauce. My margherita pizza didn't disappoint either. My attention was all on the crust (my favourite part) which was finished off with a dusting of corn meal that added a nice bit of crunch. With just three toppings — mozzarella, tomato sauce and sweet basil — the ingredients were able to take centre stage and the slightly thin crust pizza was quickly inhaled. Not that I could polish the whole thing off, six slices is a bit more than I can manage, but made a welcome addition to my fridge. 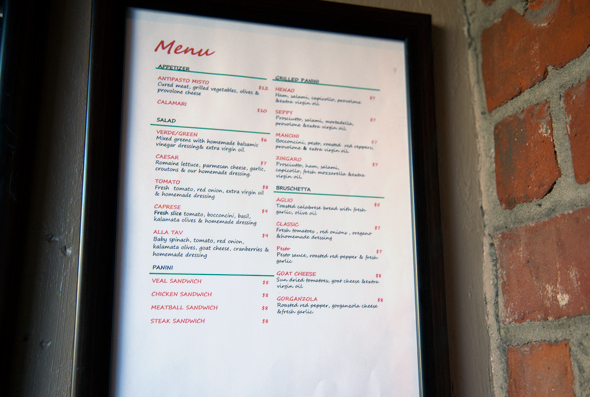 Our plates are quickly cleared — the server is buzzing about with several tables at this point — and before I can order an espresso, our bill is presented. While the service needs a little fine-tuning (they must be accustom to all that take-out traffic), the food certainly does not. I would definitely go back, and maybe next time I'll get that coffee.